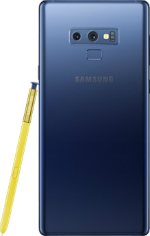 The Samsung Galaxy Note9 is a rugged device with a 6.4-inch Super AMOLED display with 1440x2960 resolution. 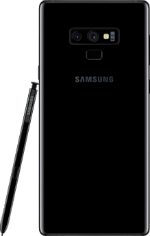 The phone is powered by a 2.8GHz Octa-Core Qualcomm Snapdragon 845 processor with a choice of either 128GB of onboard storage/6GB of RAM or the 512GB internal storage/8GB of RAM. There is a microSD card slot for up to 512GB memory expansion. The device has two 12-megapixel cameras on the back with 4K video recording. In front, there is an 8-megapixel camera for selfies and video calls. 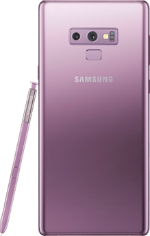 It includes a 4000mAh battery, a fingerprint sensor, NFC, iris scanner, and an S Pen. The phone runs on Android 8.1 Oreo upon release and comes in four colors: Midnight Black, Ocean Blue, Metallic Copper, and Lavender Purple.